In the event of an otherwise survivable accident, AmSafe's Seatbelt Pretensioner System protects passengers of all sizes from traumatic head and neck injury. 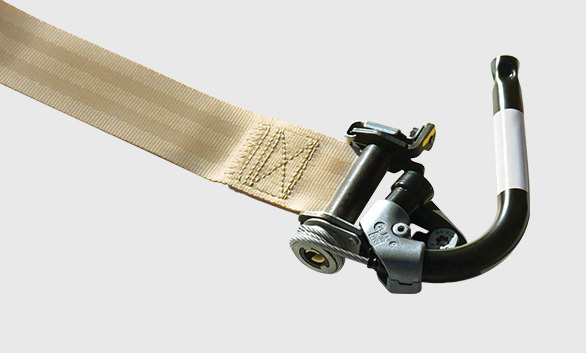 Linear and rotary seatbelt pretensioners reduce occupant headpath by up to 4.5 inches by retracting the seatbelt webbing in milliseconds, helping to avoid contact with forward strike hazards. Small form factors can be easily incorporated into the seat design. All the passenger sees and feels is a standard lap belt. Two-point pretensioner systems retract the seatbelt, and the advanced design limits the seatbelt load to non-injurious levels. Multi-point pretensioner systems retract the shoulder harness, dramatically reducing forward head excursion. AmSafe’s airbag and pretensioner systems are controlled by Electronics Module Assembly (EMA). The EMA is comprised of the system electronics, crash sensors and an advanced, non-rechargeable lithium battery. The EMA can control up to 3 pretensioners. The sensor and electronics detects and analyzes decelerations. The pretensioner will not retract inadvertently during normal operations such as a hard landing, random vibration or food cart strikes on the seat. Seatbelt retraction will occur, however, when a force is at or above 6gs for approximately 50 milliseconds. NexGen EMA: Designed for passenger seats, the NexGen EMA has integrated system diagnostics that can be operated wirelessly. The NexGen EMA has a battery life of 10 years. V23 EMA: Designed for pilot/co-pilot seats, the V23 EMA has specialized electronics designed for the specific safety requirements of the pilot/co-pilot position. The V23 EMA has a battery life of 7 years. The cable interface assembly connects the EMA to one, two or three pretensioners. AmSafe’s airbag and pretensioner systems diagnostics need to be performed at 4,000 flight hours for commercial aircraft applications. All maintenance procedures and diagnostics are performed by pushing the test button on the EMA or by using AmSafe’s wireless software to check the entire cabin at one time without accessing the EMAs. Trained technicians can easily perform the test.